• How dirty is the wastewater with respect to specific compounds or total parameters; and how can I measure these parameters or the concentration of these specific compounds? • What is the best point to take a sample for analysis from a river or treatment plant? • What is the best method for taking samples (sampling by drawing within a short time, sampling and mixing within a given time period of 1-2 h)? • How frequently should samples be taken, once per hour, per day, per week or per year? One of the first methods developed was the measurement of potassium permanganate (KMnO4) consumption for the oxidation of organic compounds dissolved in water (Marqueritte 1846). It took 23 years until Frankland proposed to the Royal Commission of England what else should be measured and how this can be done (Frankland 1869b). Malz in 1999 divided the time which followed into three periods. During the first period (1870-1920), wastewater was mostly characterized by colour and smell, although many methods were available for measuring different compounds. 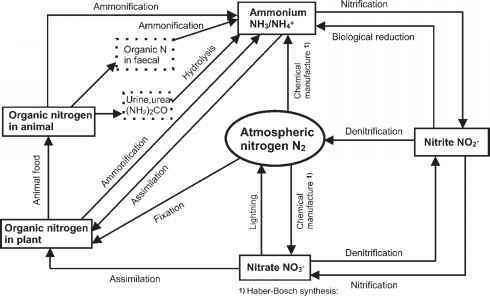 The ability of the wastewater to digest and to form gases (CH4, CO2) was of interest as well as the concentrations of potassium, magnesium and nitrogen to characterize the value for use as fertilizer (Mohajeri 2002). Not until the second period (1920-1970) were some simple methods used for measuring specific compounds (BOD5, COD, dissolved oxygen, pH, conductivity, solid concentration, etc.). The most important problem was that standard methods did not exist. Frequently, one water sample investigated in two different laboratories gave two different results lying considerably beyond the range of confidence. The third period since 1970 is the time of using more and more methods controlled by computers with automatic sampling (COD, DOC, AOX) and the analysis of individual organic and inorganic compounds (different detectors after separation by GC, HPLC, etc. ; Malz 1998; Mohajeri 2002). It was very important to standardize the methods of sample-taking, storage and measurement. Often, national standards were agreed upon only after drawn-out discussions. As a result of the development of political and economical confederations, further agreements on standards had to be developed (EU guidelines for prevention of water pollution; Poppinghaus et al. 1994).